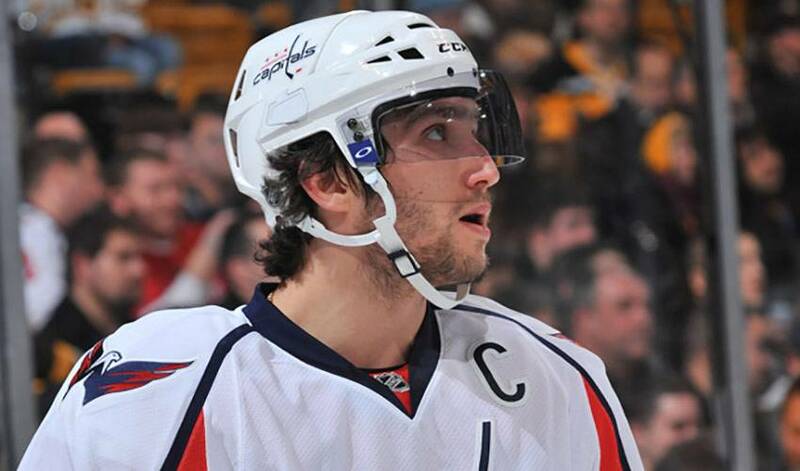 Apparently being named team captain has sat very well with Alex Ovechkin. After going pointless in a game on January 5th, his first night with the “C” on his sweater, Alex has been on a tear ever since, making the score sheet in eight straight games, accumulating 18 points in the process. Coincidentally, the Capitals have won seven of those eight games. This past week, Alex scored four goals and assisted on seven others, with a five-point game against the Maple Leafs serving as his best of the bunch. He also reached the 30-goal mark for the fifth consecutive season, as well as collecting the 250th goal of his career on Thursday night against the Penguins. Ovechkin's 68 points put him in 2nd for the NHL's scoring race behind Henrik Sedin and with his 30th tally he sits tied with fellow 2010 Russian Olympic teammate, Ilya Kovalchuk and behind only Patrick Marleau and Sidney Crosby for the overall NHL goal-scoring lead. It is quickly shaping up to be a two-horse race between the Sharks and the Blackhawks for the Presidents' Trophy this season and the latest advantage goes to San Jose. In wins over Edmonton, Calgary, Los Angeles and Anaheim this week, the Sharks outscored their opposition 21-5 while winning all four games, a stretch that included a 9-1 demolition of the Flames on Tuesday night. As a testament to their depth, eight different Sharks scored in the game against the Flames, with Dany Heatley picking up the only multi-goal night. The Sharks have a little bit of everything, not to mention a whole lot of firepower that can make matching-up against them a nightmare for any defence corps. While playing his first game back in Pittsburgh after a Western Canadian road trip where he faced a blitz from the Canadian media that would have made the Steelers proud, it would have been understandable if Sidney Crosby had needed a game to reset and collect his bearings. This was certainly not the case for the superstar , as the Pens' young captain collected 6 points (2 goals, 4 assists) in helping his team hold off the white-hot Islanders at the Igloo, by a score of 6-4. This offensive outburst matches Sid's career-high for points in one game. Crosby has been held scoreless in his previous two games, but he got the first period's only goal, set up Evgeni Malkin and Bill Guerin for power-play goals early in the second, and then scored again to make it a 4-1 lead for Pittsburgh. The Islanders roared back with three straight to tie the game, but two Crosby-assisted Malkin goals later, the Pens had all they needed to hold off the Isles. The younger brother of Anthony, who is currently playing with the Chicago Wolves of the AHL, Chris Stewart is truly blossoming in his second NHL campaign. The 22-year old from Toronto, ON is a true power forward in the making, blessed with a terrific blend of skill and size. He is currently thriving with the other young Avalanche players and is working on an impressive season, having scored 16 goals to go along with 17 assists. Lately, Chris has been stringing together some of his best hockey to date. He has goals in three straight games and has been held without a point in only one of Colorado's seven contests in 2010. Playing against the New York Rangers on Saturday night, Chris Mason won his fourth straight start for the Blues, and in the process, collected the 100th victory of his six-year career that has seen him spend time between the pipes in Nashville and St. Louis. The milestone helped cap off a fantastic week for the Red Deer, AB native, who allowed only five goals in four games and shutout the Wild at home. Congratulations from NHLPA.com on this accomplishment, Chris. - Ottawa goaltender Brian Elliot about Sens' captain Daniel Alfredsson, who returned to the lineup after missing three weeks with a shoulder injury and scored six points in his first two games, including a hat-trick against Boston.